Returning Home by Aaron Paquette. Image retrieved from: https://www.deviantart.com/aaronpaquette/art/Returning-Home-194546431. For the last two weeks of the blog, the ReconciliAction team looked at various forms of Indigenous art, music, and culture. We began with an Album Review of “Native North America (Vol. 1)”, which included songs from Indigenous musicians from Canada and Alaska. The post discussed the musical “counterculture” movement of the 60s and 70s that served as inspiration for many artists, and also offered our readers a closer look at some of the artists on the album. The team then continued our discussions of Indigenous music in the following post, which focused on Jeremy Dutcher, a musician from Tobique First Nation, New Brunswick. Dutcher has done amazing work in revitalizing Indigenous language, the importance of which is highlighted in the TRC Calls to Action and UNDRIP. The team then switched gears from Indigenous music, to Indigenous space within Edmonton. First, we covered the reopening of the Royal Alberta Museum (now the biggest museum in Western Canada), and how the museum has honoured Indigenous culture and history. We then encouraged our readers to attend Edmonton’s Indigenous Art Park, named ᐄᓃᐤ (ÎNÎW) River Lot 11∞, which features artwork by Canadian Indigenous artists. The park opened in September 2018, and is a permanent space in our City. Focusing again on Indigenous musicians, the ReconciliAction team discussed the works of throat singer, Tanya Tagaq. The post not only focused on Tagaq’s musical career, but also offered an inside glance at Tagaq’s story, and how she has come to be the artist she is today. In the following post, a member of the team was fortunate to sit down and chat with Sister Ray (Ella Coyes), a Métis singer-songwriter from Edmonton. The interview is raw and authentic, with Coyes opening up about her Indigenous roots, being a victim of sexual assault and using music as a form of decolonizing. Our team then showcased another artist whose work aims at decolonization – Kent Monkman. Monkman is a Two-Spirited painter, filmmaker, and performance artist from Fish River Cree Nation, Manitoba. His work flips the colonial narrative, using humour and satire to engage viewers, and is an essential part of reconciliation, particularly for those who identify as Two-Spirited. 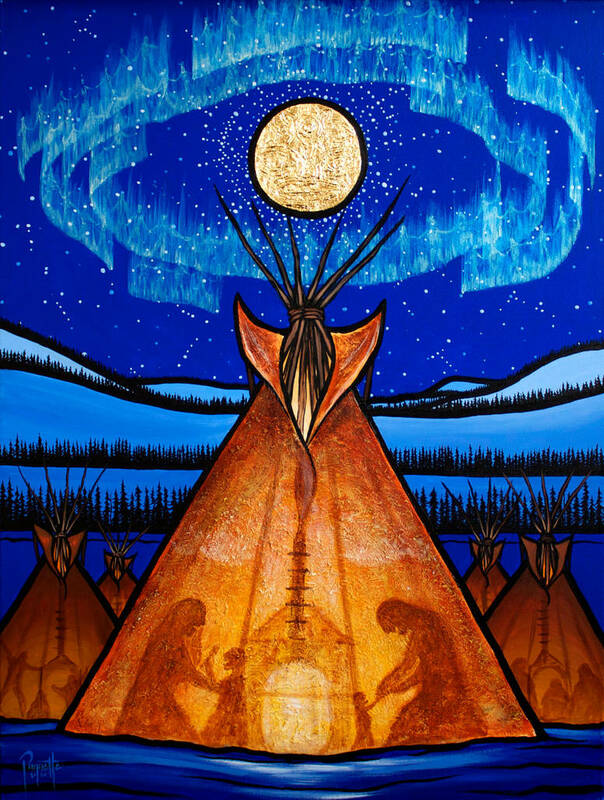 Showcasing another artist, the team then focused on the work of Aaron Paquette (see photo above), who is not only a politician but also an artist, author and advocate. The post discussed Paquette’s work within each of these roles, which in themselves are amazing accomplishments, and his efforts in bringing change for Indigenous and Métis communities. Our final post on Indigenous arts and music focused on totem poles, and the significance of these large monuments to their Indigenous makers. The post also looked at the repatriation of totem poles, which were historically stolen by European settlers and placed in museums, an unfortunate fate for many of these sacred monuments. The team then ended the week by congratulating the Honourable Judge Cheryl Arcand-Kootenay, who was recently appointed to the Bench. Judge Arcand-Kootenay is Cree from the Alexander First Nation, and is the first Treaty 6 woman to be appointed to the Provincial Court of Alberta. Team ReconiliAction YEG recognizes the accomplishments of all the above mentioned artists, musicians, leaders, advocates, and role models. Their stories remind us that anything is possible, especially when it comes to Indigenous social change and leadership. We also thank the groups that have made efforts to hear Indigenous voices, and to open up space for Indigenous arts, culture and history. Together these efforts work towards reconciliation – a movement that the team recognizes has no end goal, but is rather a work forever in progress. Kinanâskomitin (thank you) to our readers, and happy holidays! Note: the blog will return for another semester of learning/unlearning on January 7th, 2019.